The benefits one can receive from using the In Home PT Machine can be tremendous. The simple movement of the legs and arms in a walking motion, does wonders not only physically but also mentally. The human body must move in order to support it's cardiovascular needs. If you have a birth defect or acquire an injury that inhibits the movement of the body, you will need to find other ways to move and exercise your limbs. 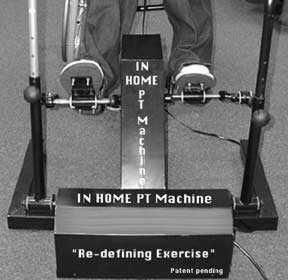 The In Home PT Machine is the answer to exercising and administering the movement needed for paralyzed or non-mobile limbs. The In Home PT Machine is designed for Parapeligics, Quadriplegics or people that can't maintain enough movement through natural means. 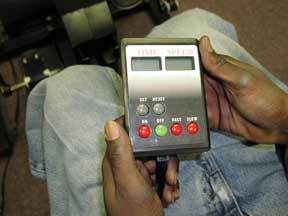 The In Home PT Machine is simple to operate and very effective. Simple to use, no transferring out of the wheelchair! Wheel up and strap your feet to the pedals and turn it on. Disabled people challenged by all levels of imparement, are enjoying movement with the In Home PT Machine. Intense study and gathering of information on what the In Home PT Machine has done in areas such as Multiple Sclerosis, Spinal Injury, Muscular Dystrophy, Cerebral Palsy, Stroke and many more has been tremendous. 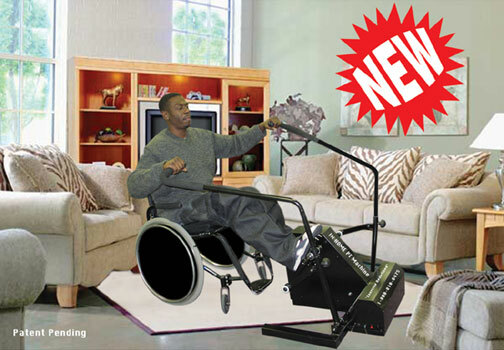 The In Home PT Machine is designed so that the disabled person sits in his/her wheelchair while exercising. The optional Seating System can be attached so that a person can use the PT machine without a wheelchair.